Of English, French, and Amerindian descent, and a native of New Bedford, Massachusetts, Donald Sidney-Fryer spent the first (formative) years eighteen years of his life in this once great whaling capital of the world, whose historic imagery of the sea haunts his poetry. After his military service in the U. S. Marine Corps he has passed the major part of his life in California. (He attended grammar school and high in his native city, and spent his four college years at U.C.L.A.) Whether in school or outside of it, languages and their respective literatures have remained a lifelong passion — he has formally studied Latin, English, French, Spanish, Italian, German and Russian — making a special examination of literature of a fantastic nature. A pioneer in the study of the major poet and fantasy fictioneer Clark Ashton Smith, he has published more than two dozen books and booklets, not to mention many articles, most of them on behalf of Ashton Smith, of which Emperor of Dreams (published 1978) represents the apogee, the only bibliography in full-scale book for devoted to the Magus of Auburn to date. 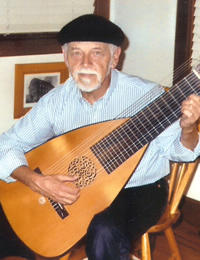 As a poet-performer, Sidney-Fryer has often accompanied his recitations of poetry with his modern chitarrone, or bass lute. A capable translator, his has rendered into English (with introduction and notes) Gaspard de la Nuit (1842) by Aloysius Bertrand, the book that inaugurated the poem in prose (Black Coat Press published Sidney-Fryer’s version in 2004). Sidney-Fryer has also done extensive research on and revival of the over-all “school” or group of mostly poets to which Ashton Smith first belonged, including especially Ambrose Bierce, George Sterling, and Nora May French. Hippocampus Press has brought out his most recent book, a major collection of poetry, the omnibus édition de luxe of his three series of Songs and Sonnets Atlantean (1971, 2003, and 2005) under the title The Atlantis Fragments (2008).